TradeSmart University Reviews - Is it a Scam or Legit? 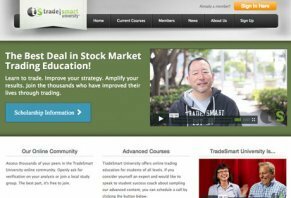 With their mission statement of "leading ordinary people through the financial markets with simple, results oriented trading education," TradeSmart University claims to help beginners and seasoned pros realize trading success. In fact, the company claims to have taught more than 45,000 students since opening its doors. TradeSmart University is owned by Financial Puzzle, Inc. based out of Brentwood, TN, and holds an A rating with the Better Business Bureau, with no complaints filed over the past three years. Although TradeSmart University claims to have been founded in 2007, online customer reviews about them were few and far between at the time of our research. However, one review from an investor claimed that some of the course information caused them to lose a great deal of money. Unfortunately, no other details were provided. Level 1: A beginner 8-class program that provides a philosophical framework for trading, how to “draw support and resistance,” as well as core basic strategies. Level 2: An intermediate 8-class program that teaches you the flexibility of Technical Analysis, and which tools and techniques you’ll need to succeed. Topics include line drawing, chart patterns, candlesticks, and indicators. Level 3: An intermediate 8-class program that pulls everything together from the first two levels, “and leads the individual to become what we consider a fluid trader.” Topics include trader conditioning, option pricing, money management, and more. All Foundations of Stocks & Options classes include access to 8 pre-recorded videos, supplemental videos, live webinars, and a class notebook. Whether you’re new to the world of Forex or a seasoned trader, this program is claimed to provide an “essential foundation” for active or semi-active traders. Level 1: Starting with the basics, the 8 courses in this section will help introduce you to the Forex, and will discuss placing orders, choosing a broker, pips, currency pairs, and more. Level 3: A culmination of Levels 1 and 2, this intermediate course is intended to help you become a “fluid trader,” or “a trader who is capable of reading and reacting to various market condition while having a handful of ﬂexible and effective strategies to succeed and proﬁt.” Includes topics such as long and short-term strategies, custom trading plans, money management, and more. 8 sequential video lessons that are claimed to help advanced “students learn about the ancient mathematical golden ratio, and how it can be applied to stock price action to help predict future prices.” Topics include Basics of Fibonacci Analysis, Elliot Wave Theory, Intraday Trading, and more. Includes access to 8 pre-recorded videos, supplemental videos, live webinars, and a class notebook. A comprehensive series of 8 individual classes “on intraday trading and shorter-term swing trading, which typically last 3 to 5 days.” Topics include trading analysis, documented back trading, how to trade a mega gap, and more. A 4-week course that is claimed to help you “master the discipline, the mental, physical and emotional pieces critical to long-term success for active traders” through 8 sequential video lessons. Hosted by TradeSmart University co-founder Josh Hesse, some of the course’s topics include trade optimization, qualifying each individual trade, Constant and Never Ending Improvement (CANI), and more. A weekly 90-minute interactive webinar discussion that claims to allow intermediate students to discuss “analysis and trade setups for the week ahead.” Occurs every Sunday at 8pm EST. Alternately, you can purchase all three levels at once through the company’s “Scholarship” program (see below for additional information) for one single payment of $895, or $89 monthly installments. In addition, you can purchase all three levels, plus access to Power Trader Live for a single payment of $1,194, or $119 monthly installments. Finally, you’ll have a third option of purchasing all three levels, plus three bonus advanced training courses: Credit Spreads, Risky Business, and Adaptive Trade Management. This option is priced at $2,095, or $209 monthly installments. Total Fibonacci Trading: One single payment of $1,600, or 12 monthly installments of $89. Power Trader Live: $49.95 per month. Power Trader Pro: $149.95 per month. While TradeSmart University claims that “youʼll receive exceptional value far beyond the cost of any course you take,” they cannot guarantee your stock trading success. Also, keep in mind that TradeSmart University claims to offer a Scholarship program, which may provide financial assistance for students interested in attending the Foundations of Stocks & Options – Level 1 course. Though the company claims that you have to “apply” for the program, when checking out through the website’s shopping cart, it appears that the course is priced the same whether you’ve officially received a scholarship or not. A wide variety of courses for beginners and experts that claim to help you become a better trader. Claims to have taught more than 45,000 students. Membership gives you limited guidance from a personal Student Success Coach. No refund policy listed on the company’s website in the event you’re dissatisfied with a course. Even though TradeSmart University claims to have been offering trading courses since 2007, we were only able to find a handful of online customer reviews during our research. Also, with very high prices and no refund policy listed, you may want to contact the company directly prior to handing over your hard-earned money. I took their courses a couple of years ago but did not have the time to pursue trading. Since then I have been exposed to a few other "plans" and also have gotten back to TSU. In my opinion, TSU is head and shoulders above everything I have heard lately. They are professional, informative and knowledgeable. They make the other ones I've seen look like complete scams. I have been a member for years and I have loved every minute of it. They have been through many changes, each one bringing an improvement in their program. They have wonderful leaders (I call them leaders rather than teachers) because they are so good, they manage to engage you in each class and go to great lengths to help you learn. Believe me, I have been through them all including one Class on site for two weeks. Nothing compared to Trade Smart University. I love it. Scammers. They charged many of their students full price while secretly giving discounts to those that back out of their web series. They are amateurs. No trading or real life experiences. Rumor has it that they are under investigation by the SEC, and the Tennessee Attorney General office. I have been participating in both the on demand web education as well as the live trading classes. Courses could be more technical but for most subscribers TSU is techy enough. Reasonable cost and reasonably easy enough use. TradeSmart is no rip off, it is great training. They have monthly membership rates and you can learn a great deal. I highly recommend their services. Write a Review for TradeSmart University!